With thick fleshy leaves leaves Scaevola crassifolia earns its common name of the ‘Thick-leaved Fan Flower’. 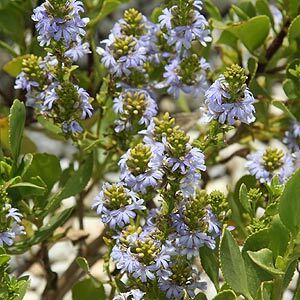 Found widely in coastal areas from South Australia to Western Australia Scaevola crassifolia also makes a useful garden plant. The thick leaves help protect the plant from salt spray in seaside conditions. With the ability to withstand constant sand and salt this is a very useful plant for regeneration of coastal dunes. In the natural environment, plants found in protected positions can reach around 1m in height, those in more exposed positions are much lower growing. Forms differ not only in height but also in flower color with varieties from white through to mauve, a pale blue and purple. Flowering is from winter to summer, however in cooler regions later flowering can be expected. A well drained soil is essential as is a sunny position. Plants can be tip pruned from a young age to retain a bush habit. Although hard pruning is not usually need Scaevola crassifolia does seem to respond. Height – This will depend on growing conditions and the cultivar. In coastal conditions plants will reach around 1 metre in height. In a protected position, up to 1.5 metres and more. Spread – Over time the plant can spread to around 2 metres. Soil – Very well drained. Flowering period – From winter through to summer depending on climate. Mainly in late spring to early summer. Producing largish seed Scaevola crassifolia is fairly easy to propagate and will self seed even in relatively harsh coastal environments.